Question. What's causing this noise like a ticking sound in my engine? What will stop it? Opinions as to the cause vary, but most people feel "its the brand of oil, or gas you use. "Changing brands of oil and using higher octane will correct the problem," some say. You may have done that and seen no improvement. We can help you - just read on. Some say: "The valves need adjustment", which will close the wear gap on the valves - ending the tick." To do so, a mechanic adjust and closes the gap by means of a nut on the valve attached assembly. For this purpose, the nut and gap is tighten 5 thousands of an inch on intake valves, and 10 thousands of an inch on exhaust valves - doing so with a paper-thin metal gage the size of your finger, made for this purpose. Since most engines have hydraulic adjusters and no mechanical nut to perform this adjustment, some mechanics offer to replace these noisy parts with new ones as a remedy. Cost runs $2000 up, and a week's time in the repair shop. As you can see in the Slo-wear product treatment picture, 6 items are needed. The 6 are easy to install, but perform amazing results to quiet the motors ticking in as little as 15 minutes - but many people say, an hour or so of driving quiets the noise. Some, "several days driving is needed in worst cases." Amazing results to quiet engine ticking noise in as little as 15 minutes - but many people say, an hour or so of driving is needed. . 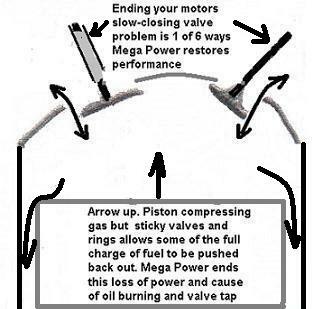 Since oil breakdown and gas and diesel fuel are prime causes of carbon deposits causing this noise, by their sludge and carbon making characteristics not letting valves "seat,", many car owners end the tick by use of new products that chemically dissolve the residues and carbon - as you drive, which permits valves and lifters to close the gap, ending the tick noise. See picture above. Cost is under $250 if a mechanic installs Slo-wear. Under $100 if you install it. Its easy. How the brand we like, we call, Slo-wear Engine Treatment, for its anti-wear and friction reducing benefits, and made and works to stop engine ticking noise. This is what your car needs if you read this far, I'm sure, to operate quietly! Order below. Directions to stop engine ticking noise. 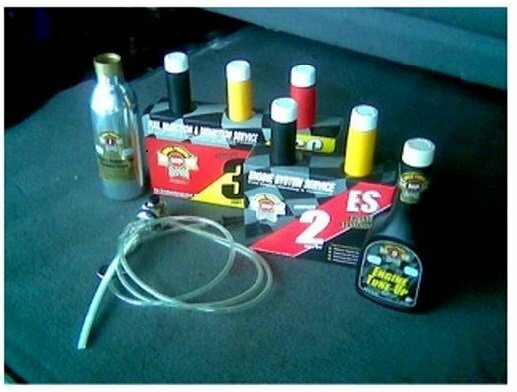 3 of the items so marked, are added as shown into the gas and motor oil. 3 are added a week later during an oil change as shown - before and after. Driving does the actual fix. Home page: engine ticking noise.